Eternal Father, whose Son Jesus Christ ascended to the throne of heaven that he might rule over all things as Lord and King: keep the Church in the unity of the Spirit and in the bond of peace, and bring the whole created order to worship at his feet; who is alive and reigns with you, in the unity of the Holy Spirit, one God, now and for ever. Amen. The days are surely coming, says the Lord, when I will raise up for David a righteous Branch, and he shall reign as king and deal wisely, and shall execute justice and righteousness in the land. In his days Judah will be saved and Israel will live in safety. Though the waters rage and swell, *and though the mountains quake at the towering seas. There is a river whose streams make glad the city of God, *the holy place of the dwelling of the Most High. God is in the midst of her; therefore shall she not be removed; *God shall help her at the break of day. The nations are in uproar and the kingdoms are shaken, *but God utters his voice and the earth shall melt away. The Lord of hosts is with us; *the God of Jacob is our stronghold. Come and behold the works of the Lord, *what destruction he has wrought upon the earth. He makes wars to cease in all the world; *he shatters the bow and snaps the spear and burns the chariots in the fire. Brothers and sisters: May you be made strong with all the strength that comes from his glorious power, and may you be prepared to endure everything with patience, while joyfully giving thanks to the Father, who has enabled you to share in the inheritance of the saints in the light. He has rescued us from the power of darkness and transferred us into the kingdom of his beloved Son, in whom we have redemption, the forgiveness of sins. He is the image of the invisible God, the firstborn of all creation; for in him all things in heaven and on earth were created, things visible and invisible, whether thrones or dominions or rulers or powers – all things have been created through him and for him. He himself is before all things, and in him all things hold together. He is the head of the body, the church; he is the beginning, the firstborn from the dead, so that he might come to have first place in everything. For in him all the fullness of God was pleased to dwell, and through him God was pleased to reconcile to himself all things, whether on earth or in heaven, by making peace through the blood of his cross. 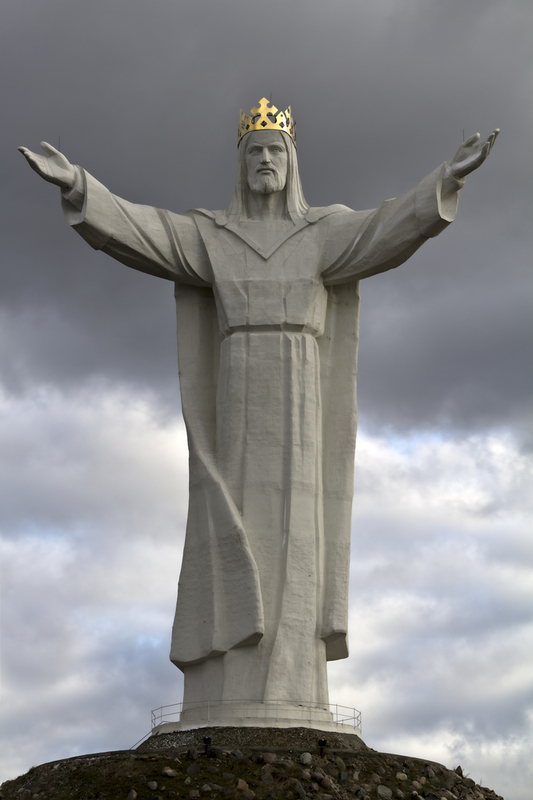 This is the Feast of Christ in his majesty, Christ the King. It is also the Sunday Next Before Advent and marks the end of the Church year, and the end of our three year cycle of liturgy. Next week is da capo, as we move back to Advent in Year A. So for me, this is a week with a flourish in which we celebrate Christ’s majesty, certainly. Also the fact that he is our king, whether as a baby or after his resurrection. And also, in a sort of play on words, we think about God’s kingdom and our role in making it a reality here on earth. Lord and Father of all, as often as we try to separate ourselves from you, you run to meet us in all the joys, distress and complexities of our lives, and time and time again we fail to recognise you. Give us such a sense of all your mercies that our hearts may be filled with praise. Break the bread of our lives to your glory, as we carry the flickering candle of our faith into the sunshine blaze of your glory. Lord, look down on your Church as we stoop and try to build it up with worn-out tools. How long, O Lord, how long? The seeming endlessness of care, the commitment to carrying on long after energy is spent, you who slumbers not, have mercy on our bone-weariness, we beseech you. In our weakness, fill us with your strength, permeating our whole being with your timelessness and rendering our question meaningless. Then shall we soar with the eagles as we work together to bring your kingdom alive here on earth. King of glory, through your power may we build your kingdom: in your mercy, hear our prayer. Lord, we yearn so deeply for you to put an end to all war in the world, breaking the bow and shattering the spear into splinters, throwing our weapons on the fire. But you have told us that there is no safety without risk; if we would live at peace you challenge us first to dare to live without fortresses. Infuse us with the courage so to disarm, knowing that in our very weakness lies our strength if our aim is the furthering of your kingdom. At the still centre of our turning world, may we simply rest and be, drawing strength from – and giving our energy to – our own immediate community. May we trust again the promise that all shall be made new in the bringing of the powers of this world to serve the purposes of God’s greater peace. Lord, we pray for those who suffer, in body, mind or spirit. May they feel your presence with them in their pain, the reality of your strength and the refuge that you offer all who turn to you. And teach us to say little, simply to hold them in our love, and listen. Lord, we bring before you those who have run with perseverance the race marked out for them, and gone to their heavenly reward. May they rest in peace, and rise to share in Christ’s glory.